Every product constructed by XMark Fitness shows you the way, in providing a home and commercial gym fitness equipment that is crafted in such a way to make your expectations proceed further. With the help of that, your muscles will be toned and get bulk if you are following its range of fitness offering. Utilizing machine, barbell or weight set, will become an option to rest in your hands, though going from any route you’ll be delivered with efficient workout and unquestionable results. 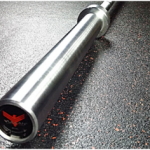 From high quality barbell construction to smooth and comfortable adjustment, XMark Fitness consist of variety of options to fulfill your fitness requirement. To pump your biceps it is essential to have an EZ curl bar that provides great momentum and spin to lift the heavy weight. 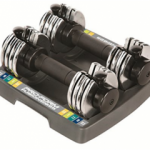 For that, the XMark CONVICT 6′ Rackable Olympic EZ Curl Bar is the best for you because of its affordability, functionality and renowned brand name. This barbell has a weight of 33 pounds which can withstand weight up to 400 pounds. The bar is constructed with solid steel in which the shaft is coated with black manganese while the sleeves are coated with hard chrome. The length of the barbell is six feet while the diameter of sleeves is kept very standard and is 28mm. The sleeves are provided with extra length of ten inches, to let you add more weight in small increments. 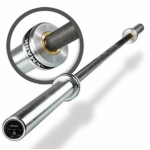 The knurling done on the barbell is very moderate to give a comfortable and secure grip. This bar consist of brass bushings means a good spin is expected from this barbell. On end cap, a convict sign is constructed to show its originality. Comes with free shipping. The Convict Six feet rack able Olympic EZ curl bar by XMark is one of America’s most used EZ curl bars that let you perform your old school workout very easily. The bar comes with a maintenance free snap ring locking system with brass bushings. The bar is six feet long having a weight of around 33 pounds which has the ability to withstand weight up to 400 pounds. Well it’s a very surprising fact to know that how can a barbell having such less weight can have such massive weight capacity, the answer is because of its durability and sturdy construction. Hence, making it perfect for beginners and professionals as they look for the barbell that is affordable and can bare maximum weight. 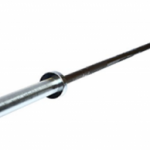 The Convict bar is perfect for performing curls as its extensive ten inches chrome coated sleeves are very durable with twenty eight millimeters bar which is coated with black manganese phosphate. The black manganese phosphate is way better than black oxide because phosphate has the ability to prevent rust and corrosion, also it can survive very well in humid regions. 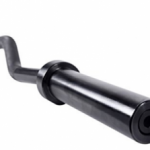 The EZ curl bars are reported to have a wear and tear more than standard barbells, so heavy duty construction is required with appropriate coating. Black oxide may chip because of falling off the barbell. Hence giving a very eye warming look, and making the bar protected from rust, corrosion and abrasion. A very weird stuff is present in this barbell regarding its design and coating. The shaft is coated with black manganese phosphate while the sleeves are made up of chrome. It is due to the fact that chrome provides greater durability and stiffness. Locking of weight plates is done on sleeves, so that portion is made thicker with a standard diameter 28mm to easily withstand plate weight. Chrome provides better rust resistant and lesser oxidation rate, making it ideal and suitable to be used in humid regions. Also, while loading/unloading the plates there may be a chance of scratches on the sleeves, so chrome resist that thing too. The knurling done on the barbell is very moderate that lets you easily adjust your hand for a firm and comfortable grip. The dual knurl marks are with respect to IPF standards, with no center knurl provided. With this bar you can perform upper body exercises very easily as they rotation of sleeves gives a very repetitive momentum while the weights are still in contact with the collars and doesn’t clang. The Convict bar is affordable than straight bar and is a great investment. If you really want to keep your barbell with fresh look and new design. It is recommended to protect the bar and wipe down regularly with a light coat of WD-40 or three in one protective oil. 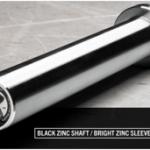 Though, sleeves aren’t really recommended for a light coat, as they have a chrome finish, but the shaft which is made of black manganese phosphate needs regular maintenance. XMark Convict bar comes with free shipping and in good packaging. 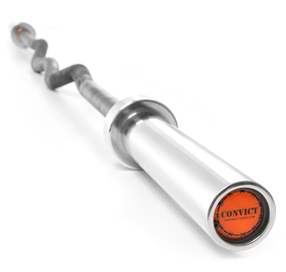 To check the originality of the barbell, you can see an orange colored convict sign on the end cap of the barbell. 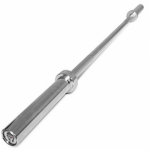 This barbell have a weight of 33 pounds which can withstand weight up to 400 pounds. The bar is constructed with solid steel. The shaft is coated with black manganese. The sleeves are coated with hard chrome. Consist of rust resistant finish on both sleeves and shaft. The length of the barbell is six feet. The diameter of sleeves is kept very standard and is 28mm. The sleeves are provided with extra length of ten inches. This bar consist of brass bushings. On end cap, a convict sign is constructed to show its originality. In my opinion, the CONVICT 6′ Rackable Olympic EZ Curl Bar by XMark Fitness is a very genuine and high quality EZ curl bar ever produced in fitness equipment market. It consist of impressive durability and budget friendly price tag. I purchased this barbell to make my biceps and upper body. The barbell arrived on my doorsteps within four days, with free shipping and immensely well packaging. When I opened the box there was a smell of I think black manganese phosphate coat, after putting the barbell on roof for couple of hours that smell also went away. I used this to perform bicep curls and while doing it I experienced that the grip and knurling on the barbell is very stiff and comfortable, while the brass bushings were giving the collars a good and repetitive spin. The weight capacity was really up to the mark. There should have been warranty included with this EZ curl bar, but still it was a brilliant purchase which led me to have much stronger upper body and biceps. Chrome and black manganese phosphate prevents rust and corrosion big time. Chrome sleeves makes the loading and unloading of sleeves very easy. Black manganese phosphate isn’t suitable to be used in humid regions. The black manganese phosphate needs proper maintenance with ointments.